Pandering to certain voting blocs is part of every election. And the 2008 race for the White House is certainly no different. But the Florida Republican primary on Tuesday has grown so politically consequential that members of the GOP field are literally donning different religious or cultural garb depending on the crowd. 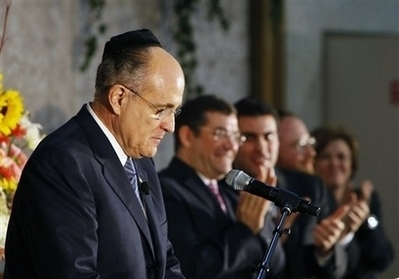 On Sunday, Rudy Giuliani delivered remarks at the Boca Raton Synagogue in Sarasota, wearing a yarmulke. The former New York City mayor, who has kept private about his Catholicism, proclaimed support for Israel and offered a commitment to combating the "Islamic terrorist war against the United States." Earlier in the weak, Giuliani appeared at the El Rey Jesus, Hispanic evangelical church and quoted scripture before a crowd of 7,000 people. He had previously said that new immigrants to the United States should have to read, write and speak English. Then there's Mitt Romney, who on Sunday donned a guayabera - a traditionally Latin American shirt - for a Sweetwater rally populated by Cuban Americans. It was a far cry from the power-blue suit and starched white shirt that the former Massachusetts Governor regularly dons. That outfit, after all, is what Romney wore when he traveled to the streets of Jacksonville last week, met inner-city voters, and asked a group of kids: "Who let the dogs out?" He followed up that diddy with an enthusiastic: "Whoo! Whoo!" Even the straight-talk express conductor himself, Sen. John McCain, has ratcheted up his Florida-pandering rhetoric. The Arizona Republican did forgo committing to the National Catastrophe Relief Fund (a big Sunshine State issue), but he has been particularly and viscerally anti-Fidel Castro this week. Even promising a crowd not to curtail funds for Radio Marti - uncensored Spanish broadcast aimed at Cuba. "I'll spend anything necessary to win the cause of freedom," he declared. Update: Yes, in an earlier version I spelled Yarmulke, "Yamaka." This was not an error. I actually checked to see if that spelling would fly. It does, but now I feel like I've let my religion down. Perhaps I should have just gone with Kippah. Thanks for the reader email.